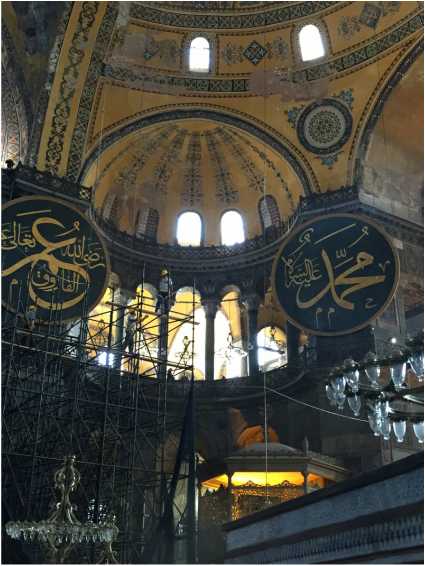 Lucy Wonsower's art history lesson and first person experience of Istanbul's ancient multicultural basilica, the Aya Sofya. I ended up in Istanbul this October through a variety of altered plans, the almost arbitrary decision to go to Turkey gave me the opportunity to visit some places I hadn’t thought about since Art History class at university. Mosques, museums, and even the souvenir shops are covered in classic Islamic calligraphy and the ancient mix of cultures that make this city completely unique. Istanbul is divided by the bosphorus, a strait that creates a physical line between the European and Asian continents on which the city lies. The European side holds Aya Sofya, or the Hagia Sophia as we know it in the West, the marvel of Byzantine architecture that anyone who has taken an intro to art history class is hopefully familiar with. Once a church, then a mosque, and now a museum, it took me almost a week into my trip to actually visit this site because of the intimidating queue that stretches across Sultan Ahmet far before the museum even opens in the morning. You can see the sandy pink building from a ways off, turrets piercing the sky above an enormous dome. "Horror Vacui, or the fear of empty spaces is a trend in Islamic art where every possible blank space is filled with Arabic calligraphy. " Emperor Justinian had it built in the 6th century for the usual reasons people had great basilicas built: honor, power, & God. Designed by mathematicians, the dome was the largest of it’s kind, and at one point the interior of the church was decorated extensively with gold and glass mosaic to reflect the “holy light of God” because that was in vogue at the time. Aya Sofya, like most really, really old stuff, was damaged and restored many times. In 1453 it was turned into a mosque, and all the of “idolatrous” Christian murals were painted over. Horror Vacui, or the fear of empty spaces, is a trend in Islamic art where every possible blank space is filled with Arabic calligraphy, or Khatt, from the Quran. As an American who grew up in the Bible Belt, I usually associate religious artwork with paintings of Jesus on a cross, so to me this extensive stylized writing struck me as both elegant and distinct. When Ataturk was president Aya Sofya was turned into a museum and a lot of the original murals have been restored. There is an intense controversy over how much of the Islamic calligraphy should get removed to reveal the Byzantine artwork. Deciding which old religious relics are more important to the cultural history of the building and the people of Turkey is complicated, emotional, and difficult. This is why the structure is such a curiosity today; the bizarre mix of cultures and religions. Light from the dome glints off of timeworn gold paintings onto enormous calligraphy placards. 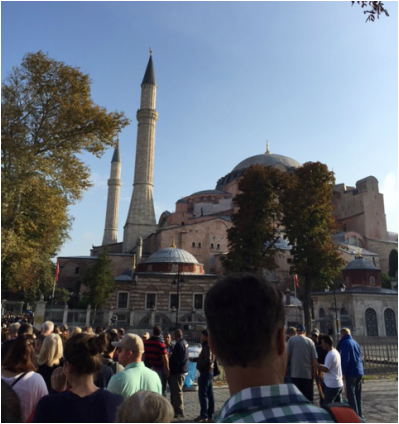 "Emperor Justinian had Aya Sofya built in the 6th century for the usual reasons people had great basilicas built: honor, power, & God. " When I visited the museum about half of it was filled with scaffolding as they worked to restore parts of the building. At all times the building is filled with tourists from every part of the world, taking photos with their extended selfie sticks and petting the cats that wander into the building from the grounds. A cat crawled onto my lap while I sat outside pondering the eerie feeling one gets in places where thousands of people have prayed. Istanbul is a mish mosh of cultures, not Roman, not Arabic, not European, but somehow all of those as well as distinctly Turkish. The Aya Sofya is surely the gem of this mix and more than 1400 years after it’s construction it is still breathtaking.